Warm weather is upon us. And after spending all winter — and some of the spring — indoors, it’s time to open the windows to let the river breezes blow in, and head outside to enjoy one of New York City’s most beautiful neighborhoods. Living in one of these Brooklyn Heights homes allows you to explore the charming side streets or settle down at the area’s farm-to-table favorites like Friend of a Farmer and Colonie. And if your idea of a warm-weather workout is more than just picking up the phone for alfresco reservations at Sociale, Brooklyn Heights has got you covered. Sure, there are more than enough boot camps, Pilates, and CrossFit studios, but after months of working up a sweat indoors, it’s time to head outside for some calorie-burning activities. Forgo SoulCycle, because there are no steamed-up gym windows or an instructor telling you what to do once you’re flying around BK on a bicycle. Pedal from the East River to Prospect Park with the entire family on the weekend. Or just hop on your CitiBike and commute to work without any worry about your Uber getting stuck in traffic on the Brooklyn Bridge. All you’ll have to worry about are the panoramic views. Whether you’re training for a marathon or just toning up for that trip to the Hamptons, runners find that the Brooklyn Heights Promenade offers a scenic trail for beginners and avid runners alike. Since the run is short, some runners like to do speed work on the Promenade. 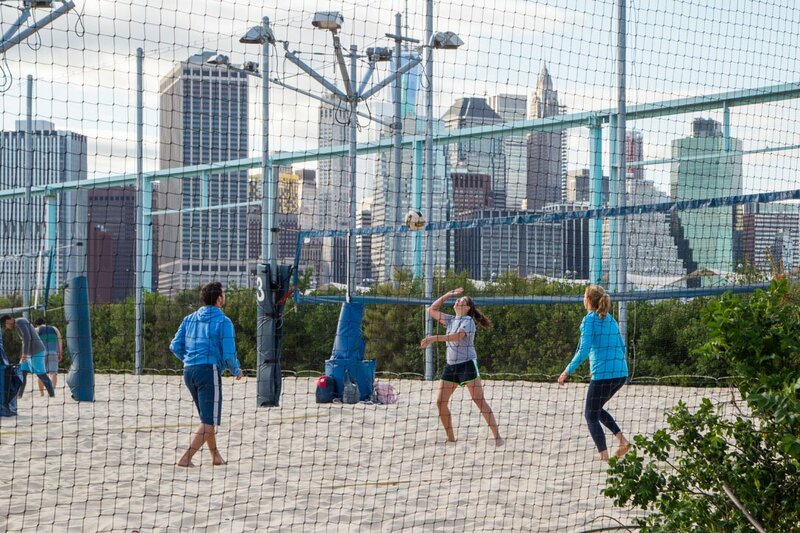 And for those who prefer a more casual workout, the Promenade is a great place to stroll or play a little basketball or soccer as the sun sets over Manhattan. One of the best parts about living in Brooklyn Heights is its proximity to the water. And on weekends when the weather is nice, why not truly appreciate the neighborhood from the water? Every Friday, Saturday, and Sunday Brooklyn Kayak Guides take small groups on a tour of New York Harbor. Participants can choose from the standard kayak or up their workout and do a paddleboarding excursion. Either way, they’re sure to see the city from a whole new perspective and get a serious arm workout too.